SOUTH CHARLOTTE SANTA SIGHTINGS! | South Charlotte Newcomers! Santa has landed in the Queen City a tiny bit early as a special present to all grown-ups ready to capture their children’s Christmas memories forever on film! Santa’s magic allows him to be in several places at the same time in South Charlotte, and each visit will provide just a little different atmosphere to please all hurried adults and eager children! Carolina Place Mall offers photo opportunities for all your little ones, including your favorite 4-legged babies! Babies of the human kind can get their cuteness captured through December 24th at Babies First Christmas located at the lower level in Dillard’s. Beloved pets can visit Santa at a special reserved time, on Mondays, 6:00p.m. through December 16th at the Dillard’s Santa Photo Set. Pajamas are always a cute donning for Christmas pics! Wriggle into your favorite snuggly jammies; bring stuffed animals and books to capture a nighttime moment Tuesdays, 6:00 pm at Pajama Party with Santa at Dillard’s. Southpark Mall, at 4400 Sharon rd., offers a beautiful holiday display with Santa as the guest of honor! Santa will be available daily in the Center Court through December 24th. Concord Mills is holding a Caring Santa event Sunday, December 8th. This special event is an opportunity for families with special needs children to enjoy a quieter environment at the Simon Santa Photo experience. Contact the mall manger, Holly Roberson at hroberso@simon.com for details. 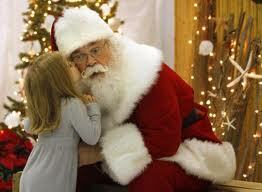 Santa through December 21st will visit Blakeney Shopping Center located in the Ballantyne area of Charlotte! Free Photos with Santa at Old Navy will be available Sunday, December 15th 11am-7pm. December 20-21st, Santa and friends will be visiting and joining in carriage rides, kids crafts and hot cocoa with cookies! The Stonecrest Shopping Center at Piper Glen will celebrate Santa’s visit with a brunch celebration! Join Santa and help the Second Harvest Food Bank on December 14th, 10am-1pm. Santa’s elves will be helping with crafts and enjoying the balloon artist entertainment! Don’t forget your camera! At the Arboretum Shopping Center located at 8008 Providence rd., families can enjoy horse-drawn carriage rides on Saturdays 5:30-8:30 pm. Santa and Mrs. Claus will be roaming and greeting around the shopping center on December 22nd, 2-5pm. Santa is always wonderfully excited to visit families in beautiful South Charlotte! Capturing those special moments of childhood excitement will be a cherished memory for many years to come. Ho Ho Ho and Merry Christmas South Charlotte!